It’s no secret that my mom is one of the most important people in my life. She is the reason I had the confidence to open my own law practice & to start LegalLee Blonde. She is such an inspiration and so, of course, I couldn’t not include her when coming up with my series of gift guides for this holiday season. Today is my first gift guide this year and inspired by gifts I think my mom would love it is a gift guide on gifts for your mom. It’s interesting because when I did a quick google search on this, there are lots of gift guides out there for new mom’s or just generally mom’s that are around my age – in their 20’s and 30’s. Surprisingly, I didn’t see as many guides for our mom’s. Ie. gifts for us 20 and 30 somethings to get our moms. 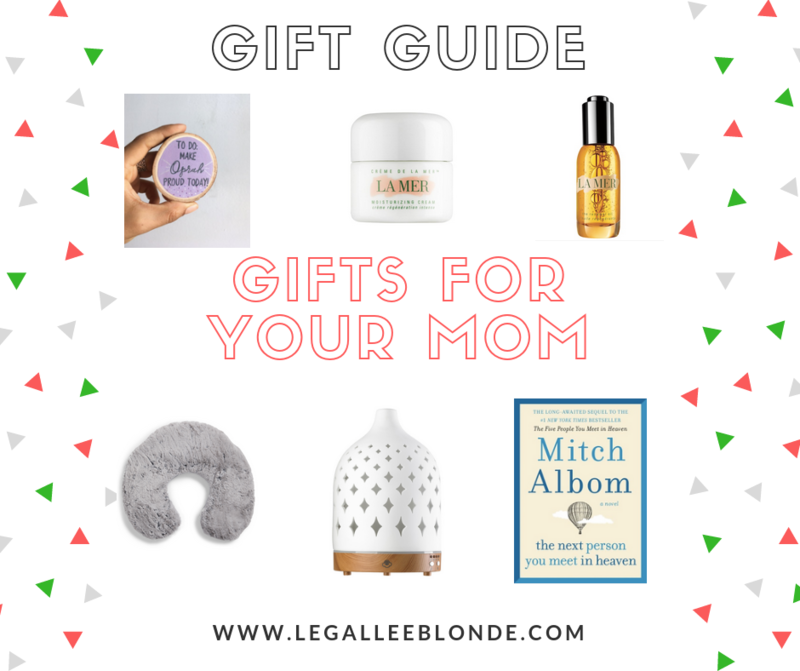 I hope this little gift guide on gifts for your mom can help fill that void and give you some inspiration for what to get your mom this Christmas. Below is a list of my top picks for gifts for your mom. You can click the link to be taken to the product, or just click on any of the images shown (I’ll share all of them after the list). Happy shopping! Silk Sleep Mask – A sleep mask that is actually comfortable! The silk is also a nice touch to make mom feel so much deserved glamor. Bear Mug – For your mama bear, this artistic bear and bird friendship mug would make a great gift. Handmade Feminist Fridge Magnets – If your mom is a strong feminist woman, she will love these! I personally laughed out loud at the “never enough oprah or iron” one haha. Creme de La Mer Moisturizing Cream – The classic La Mer product, this is a cult favorite and is considered one of the top luxury skincare products for women over 50. La Mer Renewal Oil– Another La Mer product that is a cult favorite; the renewal oil is cool because it offers endless possibilities for use. It can be used on hair, skin or nails to hydrate and provide anti-aging benefits. La Prarie Line Interception Power Duo Cream – The last luxury skincare product I had to add is this La Prarie duo cream. Women swear by the results of this product. It is a splurge, but if you’re looking to splurge on your mom this Christmas and your mom is a beauty lover, you can’t beat this! “The Next Person You Meet in Heaven” by Mitch Albom – A sequel to the insanely popular “The Five People You Meet in Heaven” this book is a great gift for any mom who is a book lover. Removable Insert Neck Pillow – This pretty and oh-so-soft neck pillow is really cool because it has a removable lavender flower and flaxseed insert that can be warmed in the microwave or cooled in the freezer to help heal and relax shoulder and neck muscles. Pretty Aromatherapy Diffuser – There are a lot of diffusers on the market; but I love that this one is as pretty as it is functional. Pair it with a couple essentials oils and this is a great gift for your mom. TheraBox – This is a monthly subscription box, so you could get your mom just one or order a few month supply so she gets gifts into the new year! This box is a self-care box designed by therapists (so cool) with goodies to focus on your well-being and promote stress relief. Perfect gift to remind your mom to take care of herself! Wake Up Slow Light Alarm Clock – I feel like no one my age (early 30’s) uses alarm clocks anymore. But you know who probably does? Your mom. Save your mom from that annoying alarm blaring every morning and help her wake up more gently with this alarm clock that simulates the sun-rising to wake your body up slowly before the alarm itself goes off. On to today’s giveaway! There were a few luxury skincare items among my selection of gifts for your mom. 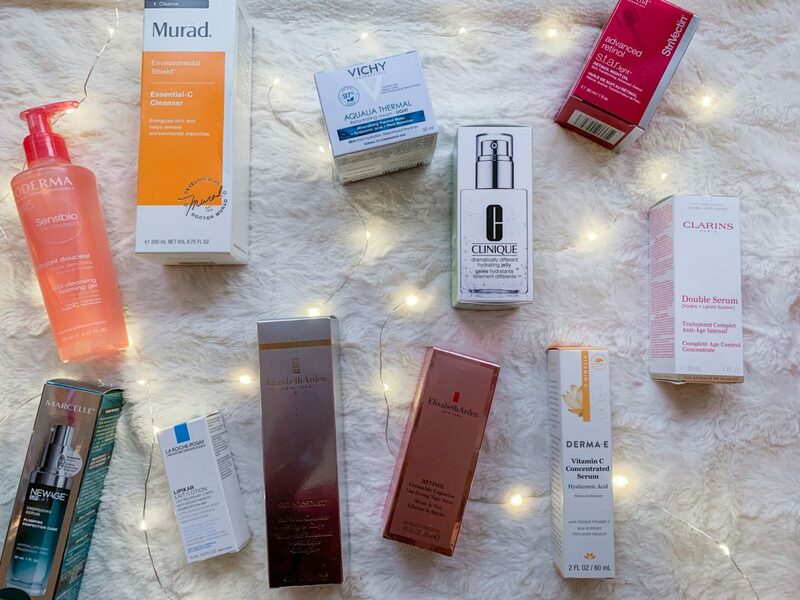 You’re in luck because today’s giveaway is a luxury skincare gift basket! You could keep some of the products for yourself and gift some to your mom for Christmas. The photo below shows most of the items in the gift basket. As you can see, there are products from brands like Vichy, La Roche Posay, Murad, StriVectin and more. such great gift ideas – my mom travels a lot and loves to read so I always get her new books! Aw I love that! That’s really thoughtful of you. These are such great gifts, my mom would love the La Mer and the mug! Lots of great picks! Pretty sure my mom would be happy with all of these! I have heard nothing but amazing things about La Mer! Definitely need to pick these up! I use their ‘main’ product – that moisturizing cream myself and it’s amazing!! My mom hasn’t mentioned wanting a diffuser but she’s in the home all day and I think that is a great gift idea! Aw yeah, that sounds like it would be a great gift for here then! My mom would love all of these products! That diffuser would be perfect for her bedroom, and that alarm clock sounds great. Such awesome ideas for momma! I especially love the mug and the alarm clock! Thanks Marlene! Glad you found it helpful! Those pjs are so cute on you and look so cozy! Happy Holidays! Thank you so much! Happy holidays to you! Hope the season has been a great one for you so far! Is my username my e-mail address on the liketoknow.it app? yep that would be perfect! Thanks!